Ballads are reflective numbers, in which characters express and explore emotions; in ballads, music dominates the lyrics. “Some Enchanted Evening” from South Pacific is a ballad. Charm songs fall in between the other two categories – they establish character or provide an opportunity for characters to comment on the story; the music and lyrics assume equal importance in charm songs. “Something’s Coming” and “I Feel Pretty,” both from West Side Story, are charm songs, serving as the audience’s musical introduction to the characters of Tony and Maria, respectively. The primary requirement of comedy songs is to make the audience laugh; the lyrics dominate here. “Adelaide’s .Lament” from Guys and Dolls is a classic comedy song. Of course, these categories only describe function. Within each there are infinite possibilities, and many great theatre songs cross boundaries: ballads can be funny, comedy songs can have catchy tunes, and charm songs can poach characteristics from both. Each score of a successful musical contains a unique mix of songs, some so specific to their theatrical moment they are uninteresting out of context, and others so universal they become pop standards. Context is especially important to Stephen Sondheim, who generally never writes a song until he knows which character is singing it, why, when, where, and to whom. Once he determines these particulars, he can decide what shape the song will take. This focus is partly why his songs don’t often cross another kind of boundary – that between theatre music and popular song, a boundary which arose with the advent of rock-and-roll in the 1950s, just as Sondheim was starting to work in the theatre. The more specific a song is, the less likely it will travel beyond its show. Comedy songs have the toughest time out of context, because the situations that make them funny cannot travel with them. 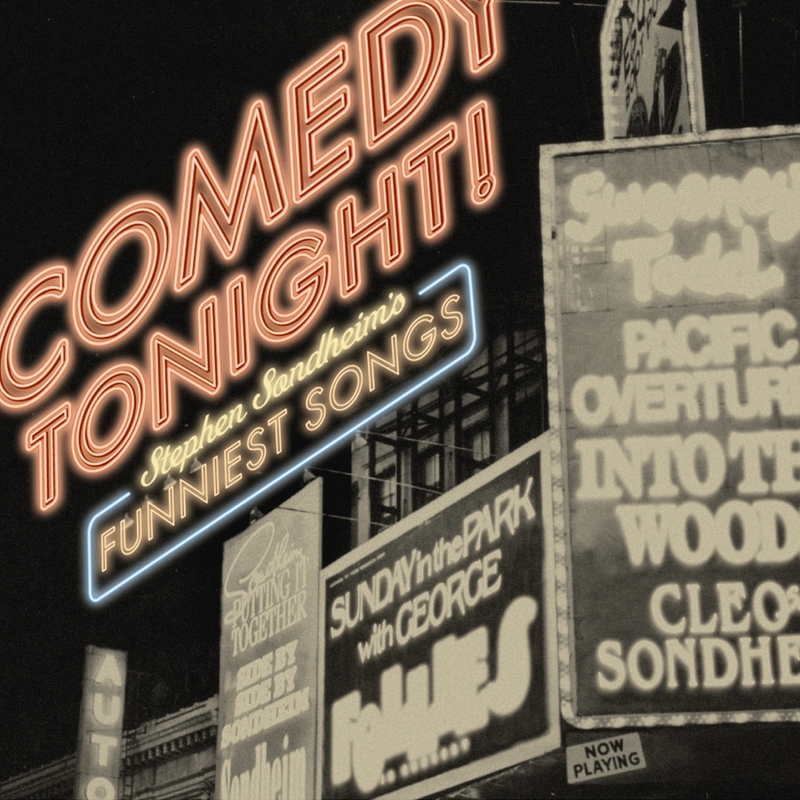 This album dares to present sixteen such numbers completely removed from their original context, to achieve another objective: demonstrating the range of Sondheim’s gifts as a writer of comedy songs. Every weapon in a lyricist’s arsenal can be found in this collection: rhyme, in its many manifestations (simple, complex, internal, unexpected); alliteration; invented words; misplaced emphasis; foreign accents; speech impediments; puns. Anything (just about) is legitimate, as long as it gets a laugh. Nowhere is this more applicable than in A Funny Thing Happened on the Way to the Forum. Ironically, with the casting of such gifted comedians as Zero Mostel and Jack Gilford, most of the laughs came from stage business rather than the score. The genial opening number, “Comedy Tonight,” effectively establishes the low tone of the evening, in this performance from the revue Jerome Robbins’ Broadway, featuring a pre-Seinfeld Jason Alexander. Another playful demonstration of Sondheim’s wit from Forum is “Everybody Ought to Have a Maid,” heard here from the cast album of Putting It Together, a Sondheim revue. Early in Sweeney Todd, “The Worst Pies in London” are purveyed by the chatty Mrs. Lovett, whose monologue also incorporates asides, exclamations, and at least one extermination. Later on, she devises a fiendishly creative way to dispose of the demon barber’s clientele and simultaneously improve her business prospects (“A Little Priest”). Angela Lansbury and Len Cariou memorably created these roles on stage and on record. Company was a breakthrough show for Sondheim, with a rich, vital score treating a complex subject – marriage – with uncommon candor. In “The Little Things You Do Together,” the oft-married Joanne catalogues the advantages of the married state. Fear of the same drives Amy, on her wedding morning, to a musical panic attack (“Getting Married Today”), accelerated by an imaginary church soloist and her adoring groom. This album features Cleo Laine, from her all-Sondheim album, and the late Madeline Kahn, from a Carnegie Hall tribute, in songs originally performed on Broadway by Elaine Stritch and Beth Howland. There are many funny songs in the fairy-tale fantasy Into the Woods, but for sustained comedy there is none better than “Agony,” in which two competitive princes compare quests. In the second act of the show, they quest again in a reprise. Robert Westenberg and Chuck Wagner, from the original cast album, display a side of the nobility we are not always privileged to see. In the script for the Sherlock Holmes film The Seven Percent Solution, a scene in a Viennese bordello required a song for the madam, portrayed by international cabaret star Regine. This elicited from Stephen Sondheim one of the raunchiest songs in his canon, “I Never• Do Anything Twice.” Less than half the song survived in the film, but fortunately the number was done many times after that, in the revue Side By Side By Sondheim, decadently rendered by Millicent Martin. As in Company, the score for Follies overflows with invention. In the phantasmagorical finale, where the main characters perform Follies-style numbers illustrating their psychological state, aristocratic Phyllis sings “The Story of Lucy and Jessie,” who just can’t seem to get it together. Alexis Smith was the original Phyllis; Lee Remick presents their predicament with panache in the album Follies in Concert. “Can That Boy Foxtrot!” was written for Yvonne De Carlo to sing in Follies, but cut from the show during previews in favor of another, more appropriate song. Fortunately, “Foxtrot” is still here, surviving well on its own, as proven by the ladies• of Side By Side By Sondheim. incorporated into a show that merged eastern and western theatrical traditions. From the original cast album, “Chrysanthemum Tea” is sung to the emperor by his mother-in-law (portrayed, in Kabuki fashion, by a man), as over the course of several days she displays wit and ingenuity in crisis management. “You Must Meet My Wife” from A Little Night Music begins as a ballad, in which Fredrik, a middle-aged lawyer, extols the virtues of his young bride to Desiree, a seasoned actress and former lover. As Desiree reacts to his description, the number evolves into one of Sondheim’s subtlest comedy numbers. David Kernan and Millicent Martin sing point and counterpoint, from Side By Side By Sondheim. Have you ever wondered what people in a painting are thinking? In the first act of Sunday in the Park with George, we encounter characters who inspire manv of the figures in Georges Seurat’s most famous canvas. Act II starts almost a century later, with the painting hanging on the wall of a museum; in “It’s Hot Up Here,” we learn just what has been on everyone’s mind all this time. Seurat’s mistress, Dot (the very name a pointillistic pun) was memorably portrayed by Bernadette Peters, joined in this song by the rest of the original cast. Early in his career, Sondheim wrote only the lyrics for three shows, as well as some special material. Since comedy songs prove themselves primarily with the lyrics, his work with other composers also belongs here. “The Boy From…,” a parody of “The Girl From Ipanema,” was introduced by a young Linda Lavin in the mid-1960s revue The Mad Show, inspired by Mad Magazine. The music is by Mary Rodgers (daughter of Richard), and the lyrics are credited to “Esteban Rio Nido” – “Stephen Sondheim” in Spanish. In Side By Side By Sondheim, Millicent Martin makes it her own. Three strippers explain their philosophy of individualism to a young lady soon to become Gypsy Rose Lee in “You Gotta Get a Gimmick,” from Gypsy. Jule Styne’s music carries Sondheim’s inspired lyrics to burlesque heaven in this performance taken from Jerome Robbins’ Broadway. Faith Prince, a future Miss Adelaide in Guys and Dolls, can be heard here as Tessie Tura. The title of this last song can serve as a signpost for anyone seeking to write a great comedy number. Stephen Sondheim brings to his musicals an unlimited supply of linguistic ‘gimmicks’ for every occasion, and the theatre is incalculably richer for it. Though it’s not usually mentioned among his major virtues as a composer, Stephen Sondheim can often display a wicked sense of humor that has found its best expression in the songs compiled in this exhilarating album. From ancient Rome (“Everybody Ought To Have A Maid”) to late 1800s England (“The Worst Pies In London”), from medieval Japan (“Chrysanthemum Tea”) to modern-day New York (“Getting Married Today”), Sondheim always seems to strike the most felicitous upbeat notes in songs in which the text and the subtext sometimes collide for best effects. A delightful package!